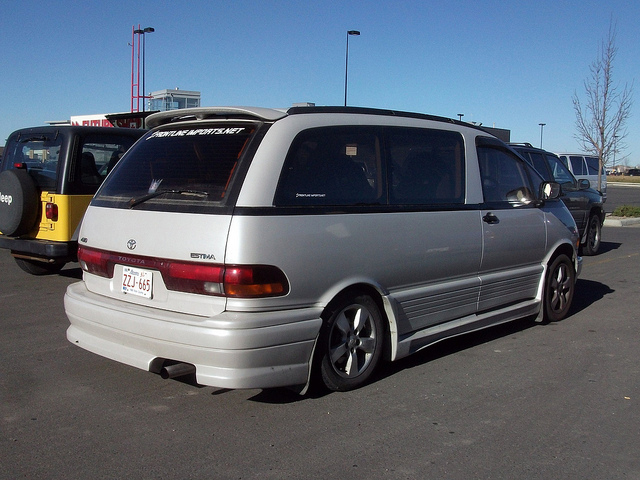 Looks just like a Toyota Previa with a body kit, doesn’t it? That is initially what I thought it was until I noticed the steering wheel’s positioning on the right side. Thanks to Canada’s import laws, today we get to sample a Toyota Estima, which has been imported from the Japanese home market and closely resembles our Previa minivan. While similar in appearance to the Previa, the Estima also came in a 4.3″ narrower and 2.8″ shorter variant for the Japanese market. These downsized versions were called Lucida and Emina, which could also be had with a diesel engine. While their scaled-down size made them more maneuverable on Japan’s smaller and more crowded roads, it also offered a tax advantage for a lower total cost. Our example today is the regular-size Estima. 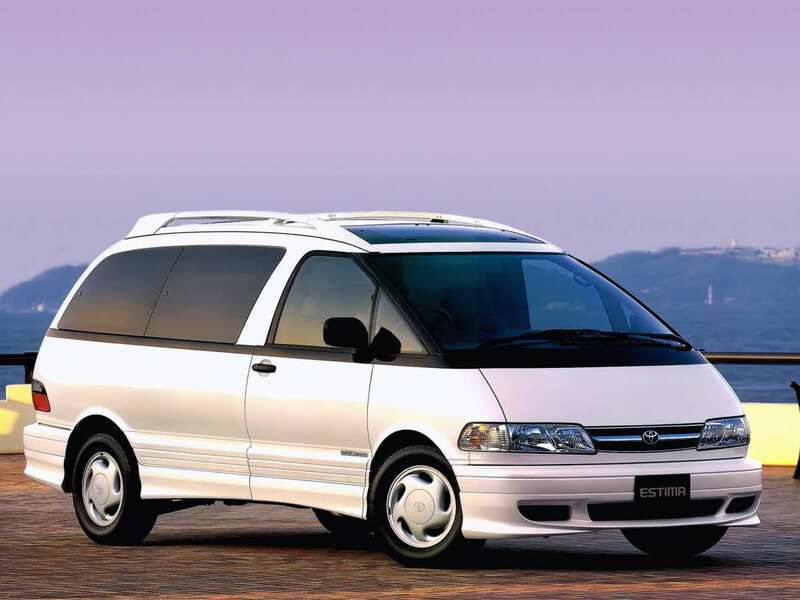 Unlike in the North American market, Toyota offeredd the Estima to Japanese buyers all the way to the 2000 model year, a full three years longer than the Previa. Power options were a 2.4-liter inline four featuring either natural aspiration or an optional supercharger. Easily one of the most technically interesting minivans of all time, the Estima/Previa four-cylinder motor was mounted just behind the front axle, making it a mid-engine design. To minimize engine intrusion into the interior cabin, the cylinders were laid over at an angle like an old Lotus four-cylinder or Chrysler slant six, but much more so–in fact, almost horizontally. Four-wheel drive was available, and if the badging on our featured van is accurate, this example has it. I’m not sure whether the body kit is stock or not, but surely the Estima/Previa was among the few minivans able to pull it off. How much horse power do you need? I’ve seen and heard an Enema smoke the tyres from a traffic light the whistle of the turbo gave it away before I saw the tyre smoke and it was gone, a Mum in a real hurry. Seriously more power and room is available in the Hiace commercial passenger lounge division Carmine & Tom would need to be restrained power curtains and other tricks make these Custom lounges the Brougham kings the best have the 3.0L turbo diesel and can hustle along ok.
You’re totally right about these being able to pull of a body kit. I adore these vans with the popular VIP treatment. Interiors get especially bananas…. 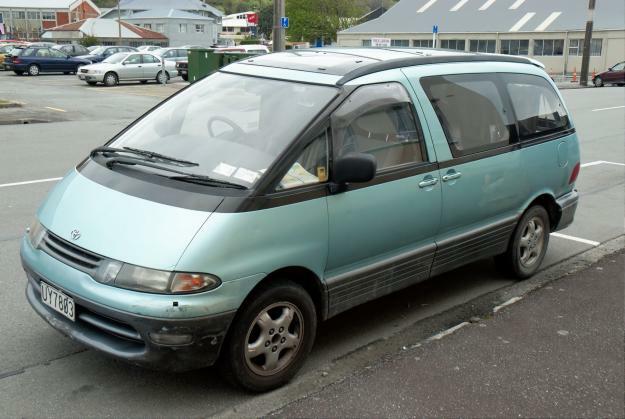 About 99% of minivans I see with body kits have them to blend in a lowered-floor wheelchair access conversion – I don’t get the impression of that on the bodykitted Previas, but then I know where the engine is. It would be interesting to see how a normal-depth ground effects kit would look on a Caravan with stock or lowered suspension. I love these Japanese home-market cars that make it into Canada. A cool find, and a vehicle that I have never seen. Previas were not all that common around here, I am guessing due to cost. Agreed that this is a most interesting take on the minivan. 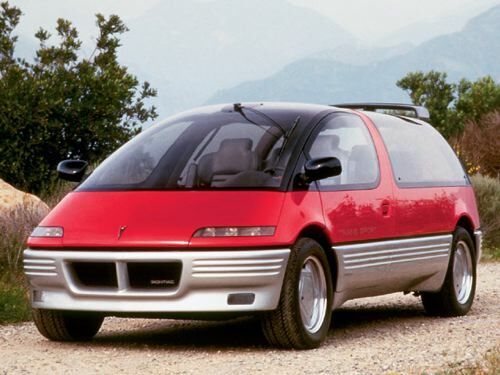 The funny thing is if you took the first and second generation GM “dust buster” minivans and put them side by side (especially the Pontiac models) with this Estima they would look like they were built by the same company. Yes I’d not seen a dustbuster until here at the curb and the similarity is amazing but the GM one failed. Similar concept, but Toyota’s design was much more space efficient. Looking at the GM Dustbuster in profile, almost half the overall length was wasted, with perhaps 1/4 of the overall length in that huge dashboard alone. The Aeras breed are the bodykit kings but that one pictured is very common it must be stock, cool vans really,with independant suspension all round these can be driven quite fast by anyone brave enough and one will actually hold the road. Toyota didnt envisage a commercial application beyond taxi service I’m surprised by their lack of immagination these are the new VWKombi amongst backpackers and some Ive seen have clocked huge mileages and of course the neglected ones die to keep the good herd running in perpetuity. I simply meant that they look like “Gen 1” (pointy nose), Gen 2 (rounded nose), Gen 3 (Estima). Kind of like Christina Ricci looks like Angelina Jolie; similar specifications, but much different execution. Estima, Lucida and Emina. Cinderella’s wicked step-sisters? Notice the drivetrain/running gear photo depicts AllTrac and what looks to be an intercooler. Turbo diesel AWD probably can be found in manual occasionally I’d take a good one of those and camperise it. I’m pretty sure that shaft going to the front is the SAD shaft, that drives the accessories, which are mounted remotely. Yeah the engine lays over some but not compared to an underfoor diesel bus engine if you service it correctly it will run forever if not, well clever people who like to not pay for Toyota servicing on their common rail diesels are learning the hard way the injector failures they moan about are because somebody didnt do a proper service @ what ever mileage it was Toyota detected failures at and made the improved injectors a service item some commercial courier vans are getting past the million kilometer mark if serviced according to schedule the injectors are over the counter items not cheap, no but they did warn you bro read the handbook or check with Toyota they have a database of all NZ new cars and what genuine work has been carried out my/dads Corona ate a waterpump @ 37,000 kms nobody knows why it lost its coolant while parked dad saw the green lake, The local agent fixed it. I changed the cambelt around 140,000 kms and oil&filters regularly and it never really went wrong I sold it to a young lady who lives nearby they never came back and complained I see it now and then its been hit a few times but still runs ok she and her whanau still drive it. I have been off and on thinking of getting a Previa, which is dirt cheap these days. Then swap in a Subaru Flat 6 and use it for road trips. Style, some performance, and Toyota reliability. For $10k or so, one can have a one of a kind van. 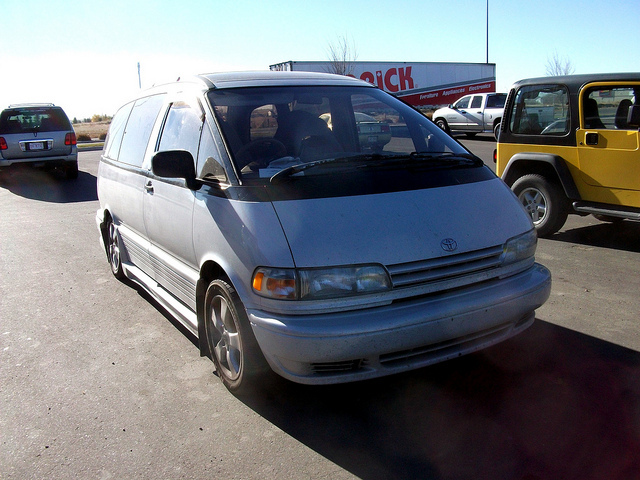 Couple of concerns, Previa has bad frontal collision test results. H6 probably means no awd. Swapping in another engine in this vehicle would probably be an epic undertaking, given its location, complexity, etc… Look for a supercharged version. if you want more power. 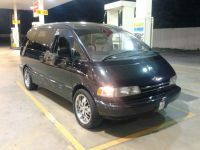 I did own a Previa with supercharger, ’95 or ’96? can’t remember but it was the first year toyota offered supercharge for Previa. It was somewhat adequate but one wouldn’t say powerful. I have no experience with either a Previa or a Subaru flat 6, but wonder why someone would consider putting an engine that is reputed to eat head gaskets in such an impossible-to service location. Not trying to be a smartass, just asking. wow, didn’t know the Subaru H6 has head gasket issue! Then yeah, very bad idea to put H6 under seats. The H6 has no head gasket issues. For the most part the head gaskets are a 99 and older 2.5 flat 4 problem. The Previa has a jackshaft running forward from the engine to power the accessories, (such as alternator, water pump, power steering perhaps?) which are located under the hood. Another complication for an engine swap. I do know that a lot of guys swap flat-6 Subies into VW vans – I know one guy who has one, and he’s not even a car guy, just someone who didn’t want to always be at the front of a long line of cars on every two-lane road. But into something like a Previa, no way. I see the accessory drive coming off the front of the engine now and a propulsion shaft coming off the transfer case….this seems like an awful lot of complexity for the sake of mid-engine under-floor design. Only the Japanese could make something like this work. Somehow I think engineers in Japanese car company has a bit more influence than their American counterpart. It’s written in the Japanese DNA: “Thou Shalt NOT Fail”. Therefore it’s a downright dishonor to fail or to make mistakes. That’s the main reason why Japanese cars are so good. I mean cars actually built in Japan by the Japanese and with Made-in-Japan parts and components only. Great article – these are absolutely superb vans – have owned a US spec version that had over 200K miles and was still going strong when I sold it. Currently have a JDM Lucida version here in Tokyo. With the drivetrain tucked up under the chassis and difficult to get at, Toyota made the engine even stronger than normal – timing chain never needs changed. The supplementary accessory drive shaft is very reliable also, as long as its given a little lubricant during regular oil changes. The low center of gravity and mid-engined design made these very stable handlers in comparison to other vans in their day. JDM versions came in a variety of models, some with “aero” kits like this that added quite a bit of cladding. Estimas/Lucidas are still sold here in Japan, though they changed to a normal transverse front wheel drive platform after this first generation. I still think they’re very attractively designed. They really have aged nicely. Almost space-like when they came out but now look almost elegant. Would love to have that van as my cruiser. Oops, a bit late getting to this one. I was a teen when the Previa came out, and although minivans didn’t interest me, the Previa changed that. At the time our family car was a Toyota Townace Super-Extra! (exclamation point mine), aka Toyota Van in the States. Like most minivans here then, the Townace was a forward-control van where the front seat occupants occupied the frontal crush zone. Considering I was often in our Townace’s front seat, the Previa looked so much safer! Overall it looked great for the time, the interior was interesting, and I found the weirdo mechanical layout fascinating. They were REALLY expensive though, so I didn’t see that many around until the mid-90s when the used JDM models started arriving. Once that happened, we had Estimas, Lucidas and Eminas coming out our ears. Still do actually, as they seem to go forever. Mind you the last one I passengered in, about 4 years ago, was on its 4th time around the clock, and boy did it feel loose… The huge sunroof and sliding door rattled like crazy. Fun fact: you can tell the narrow and wide body versions apart from the front by the wipers. Wide bodies have the ‘clap hands’ wipers, narrows have them both sweeping in the same direction. It’s a bit harder to tell from behind, usually the distance from the tip of the wiper to the D pillar is the giveaway.